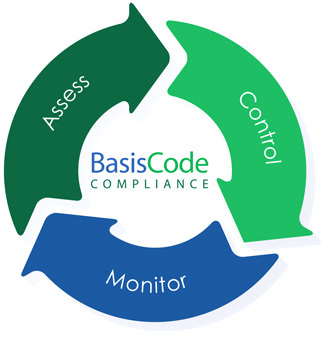 The BasisCode Compliance suite of compliance management software solutions are used by some of the world’s leading financial services, consulting, legal, accounting, fund administrator and broker-dealer organizations. 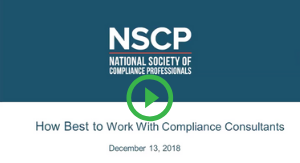 Hear what leading compliance industry professionals and consultants have to say on how best to utilize compliance consultants in a recent webinar hosted by the National Society of Compliance Professionals (NSCP). BasisCode has financial compliance software that work for every size and every need. Core software for organizations with basic compliance needs; enterprise software for firms requiring more comprehensive solutions. Every BasisCode compliance software solution is scalable and flexible to meet your organization’s needs. A revolutionary proactive approach to monitoring Insider Trading! Enables users to detect suspicious or abnormal trading that may have resulted from the misuse of material non-public information. Available as a standalone software solution or as part of an integrated suite. The core of a robust compliance and reporting program. Essentials covers testing and certifications, risk assessment, gifts and entertainment, whistleblower, document portal and employee portal. A comprehensive compliance management software solution dedicated to larger firms with a global or more complex footprint. Enterprise covers testing and certifications, risk assessment, gifts and entertainment, whistleblower, personal trading, forms studio, documents portal, extensive reporting and an employee portal. Streamlines management of personal trading including pre-clearance and post clearance, trade request analysis and employee-managed or direct feed brokerage options. Available as standalone or as part of an integrated suite. Replace hardcopy documents using a flexible tool that enables employees to submit forms online. Developed exclusively to allow compliance consultants to enhance compliance management controls, improve staff performance and productivity, and increase operational efficiency and scalability. "We got up and running in less than a month without the risk and overhead of …installing software in-house…"
"BasisCode Compliance’s flexibility has enabled Northwest Asset Management to centralize our custom compliance program and manage Investment Advisor Representatives regulatory requirements while streamlining workflow. Our recent external audit is evidence of the benefits resulting from having a robust platform…"
"BasisCode Compliance is a great all-around compliance system...As a result of the different modules of the system we have efficiently streamlined all of the Code of Ethics reporting, audits, tests, reviews and data that we are required to collect and store..."
"BasisCode Compliance has been tremendous in helping Balentine effectively manage our compliance program… The BasisCode team is very responsive …I strongly recommend BasisCode Compliance to Senior Managers who want to streamline the workload associated with Regulatory and Risk Management Programs…"